« Press the pound key. Dreams are a funny thing. You can’t really tell just how long you’ve been dreaming for. This is the ongoing story of a dream that I’ve been having for a long time, probably longer than I even realize. I dream of being in a band. My name is Ernie. In my musical life, I go by the name Niveous. Sometimes by Niveous Devilchild but I don’t often use the surname as I’ve given up a lot of my lingering teen angst/ parent issues. I’m a born and raised New Yorker and except for a very black period in which I lived in New Jersey (**shudder**), I have lived in the Empire State all my life. I have traveled around the sun thirty-five times and I’m hoping to get quite a few more trips in before I’m done. Throughout my life, music has always been a big facet. 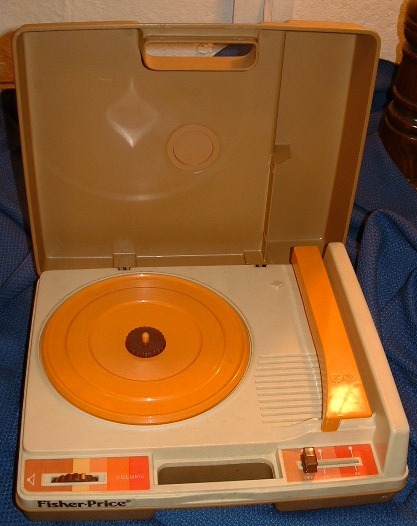 I grew up with a little Fisher Price Record Player and near-unlimited access to my family’s record collection. While that may have created some awkward moments like little kid Niv getting a hold of the Ohio Players albums, it gave me a chance to listen to a lot of music. That access to heaping handfuls of 33’s and 45’s left me a bit of a musical anachronism in the 80’s, at least to kids my age. I can remember hanging out at a childhood friend’s house. He had a couple of other neighborhood kids over and they were talking about New Edition who had just become a big deal. They asked me what music I listened to. I said I liked Queen and they looked at me as if I had just grown a second head. Looking back, I now know that those kids were out of the loop since at the same time New Edition was breaking out, Queen was topping the charts with songs like “Radio Ga Ga” and “I Want To Break Free”; but I didn’t know that back then so I felt embarassed and I didn’t talk to my friends about music much after that. But that wouldn’t last as my love of music grew steadily. I don’t know where my desire to be in a band came from. I may have liked Queen growing up but back then I didn’t know squat about who was in the band. It could have come from my desire to be like the kids on the cover of the Musical Youth album or how I would go to Blockbuster and rent video collections of INXS and Cinderella repeatedly. Maybe it was because I had watched all 65 episodes of Jem? I do know what made me start my first band though. It was 1989. By that time, I had become an obsessive watcher of the music charts, something I still do to this day. There was a TV show back then called Smash Hits, hosted by Scott Shannon (New Yorkers may recognize that name as one half of long time morning radio DJ’s Scott and Todd). Smash Hits counted down the top 10 songs of the week according to a vote done over 1-900 lines. I didn’t join in the voting process, as young Niv had already gotten in trouble for running up the family phone bill by calling 976 wrestling update hotlines, but I loved watching the show despite the fact that it often came on in the middle of the night. Hey, I was a smart kid. I had blank videotapes and knew how to program a VCR. Somewhere in-between copious amounts of Bad English, Taylor Dayne, and Kix’s “Don’t Close Your Eyes” (which I covered this year), Scott Shannon announced a songwriting contest. The winner of the contest would get a chance to go into a studio and make a song alongside Gene Simmons of KISS. Despite being only 12 years old at the time and having little or no knowledge of who the hell Gene Simmons was, for some reason I wanted to win this contest!! Was I a songwriter? I had just started writing songs. I was inspired by the music of Love & Rockets and I had just gotten cassettes of The Cure’s Disintegration and The Cult’s Sonic Temple albums. Was I any good at songwriting? Of course not, I was 12. But I had the wild determination of a 12-year-old so I set out to start a band. Starting a band when you’re 12 was surprisingly easy. You get some friends from your class together and ask if anyone wants to be in your band. God, I wish it was still that easy. My best friend at that time was a kid named Sam and he quickly joined and decided he would be the frontman. I don’t know why I gave up such a lucrative role but I did, deciding to be the band’s guitarist. Our friend Jason would round out the trio as the drummer since his dad had a ridiculously large drum set and was willing to let his son borrow it. There was one big flaw to this plan though. I didn’t play guitar yet. I borrowed my next door neighbor’s bass guitar but 1) I didn’t know a damn thing about playing bass, 2) this was pre-internet so I couldn’t just go on YouTube and watch some tutorials, and 3) I didn’t have an amp anyway. But I still had the ragged determination of a 12-year-old. And so, I got my parents to buy me a Kawasaki One Man Jam. It seemed pretty great according to the commercials. Ugh. It was a plastic toy guitar with frets and real electronic sounds. But my friends didn’t care and we became a band. It came time to choose the band name and Sam suggested Wild Stallions, just like the band in Bill & Ted’s Excellent Adventure. I didn’t know the film back then but I did know that we couldn’t have the same name as a band from the movie. I suggested we change Wild to Young. 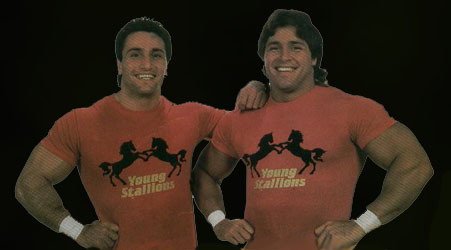 Sam & Jason had no clue that I had made the change by swiping the name of a crappy 80’s WWE tag team, and so we became The Young Stallions. We got Jason’s dad to shuttle his big drum set over to my house and set up in the basement. We proceeded to make loud obnoxious noises with Sam singing into the end of a broom (we didn’t have mics), Jason playing the drum set full throttle and me making the loudest chirps and cheeps that I could out of my purple and blue toy guitar while we recorded the whole thing on cassette via a little silver boombox. Did we sound good? I don’t have those recordings anymore but I can venture a guess that we were probably pretty god-awful but we had an absolute blast. The Young Stallions didn’t stay together for long though. Sam moved out to Long Island and though we tried to keep the band together by rehearsing out there, I think Jason’s dad got tired of playing roadie and dragging a drum set around. And so ended my first band. So, what happened with the contest? The Young Stallions never ended up sending in an entry. For the life of me, I can’t remember why we didn’t. The contest ended up being won by a guy who did a song called “Christmas in Malibu”. How could a group of 12 year olds beat that? That may have been the end of my first band but that’s only the start of the story. Since then I have been in many different bands. Some real and some virtual. Some that lasted for a long time and others that faded before they ever did anything. But back at the end of the 80’s, I was bitten by a desire that I still can’t get rid of. I long for the feeling that you get from hanging out with a bunch of friends in a room and making music. In this blog, I’ll tell you some of the stories of the bands that I’ve been in and where I’m at in my quest to create a new one. Hope you enjoyed this first story. This entry was posted on December 18, 2012 at 2:38 pm and is filed under Music. You can follow any responses to this entry through the RSS 2.0 feed. You can leave a response, or trackback from your own site. It used to be fame was the name of the game. Lately it’s turned back to fun, which is where it should be for some 12 year old rockers. A friend’s kids started a band, and I watched their YouTube videos. They were great for their age, but the enthusiasm and how much they just ENJOYED playing was apparent. Their dad also was beaming that they were having such fun. Since he had a few musical friends, they allowed them to headline for a few songs at an all ages show – and the kids were just beside themselves. We all should find more 12 year old fun.